I apologize for the long delay in between my last post and this new one. A lot has come up and I wanted to make sure that this post was thoroughly researched before I published it. Disclaimer over, let's go back in time. In the late 1800's, several newly minted and studied architects made their way from places north to the burgeoning, modern city that was Knoxville, TN. Knoxville had really come a long way since the beginnings of reconstruction, no doubt due to the presence of a number of Union sympathizers during the war. Knoxville was a city that attracted bright minds who were looking to make a name for themselves. One of those folks was a man by the name of R.Z. Gill. Mr. Gill came to Knoxville in 1889, from Illinois. He had studied at the Illinois Industrial University in Urbana, graduating in 1886. His mentor was a man named N.C. Ricker (funny how these folks always went by initials in their professional lives). Mr. Gill worked for the prestigious Chicago architectural firm Holabird and Roche (which would mean something if you happen to be a fan of late Victorian commercial architecture in the midwest). 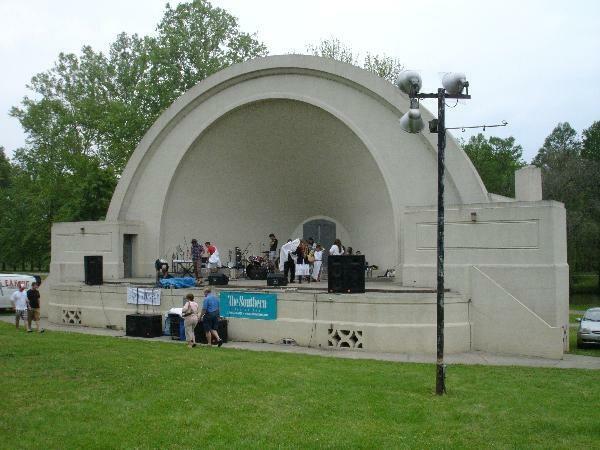 Mr. Gill didn't do much of note in Illinois before coming to Knoxville, with the exception of designing this band shell in Murphysboro, IL. The band shell, while a nice point of interest in any small town, would pale in comparison to what he would design in Knoxville. Heading west from Gay St., down Church Ave., one passes the tall Tennessee General Building on the right, then the surface parking lot that used to be Mann's Funeral Home on the left. 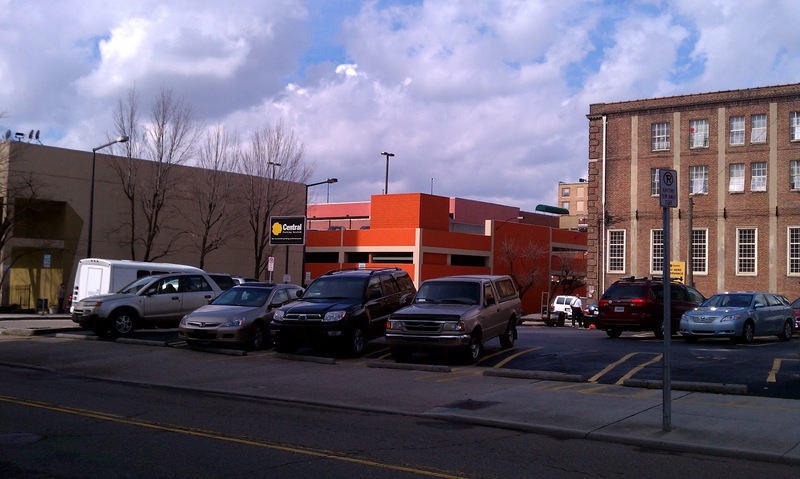 Continuing on the same block, there is yet another surface parking lot on the right, just across from the mid-century modern Walnut Building. That empty space, now housing pavement and yellow stripes, bounded in by the General Building and the YWCA, once housed one of the most eclectically wonderful buildings in all of downtown. It was something that might even rival the Vendome in terms of being the most beautiful residential/commercial building ever constructed in Knoxville to date. 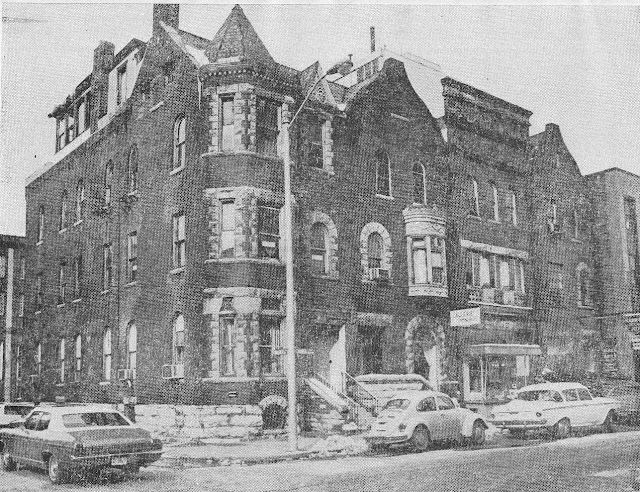 Many Knoxvillians living today may remember the Ross Flats because it (and I will start using they, since it was technically a collection of row houses) survived until 1973. Another lovely parking lot, 417-425 W. Church Ave.
To describe the Ross Flats is almost impossible. One might describe a house in 4th and Gill as being Queen Anne Victorian, or the UT Conference Center (Rich's) as being modern. The Ross Flats were all kinds of things. They were Romanesque. They were Flemmish. They were Victorian commercial. They were a mishmash but the confusion worked beautifully. 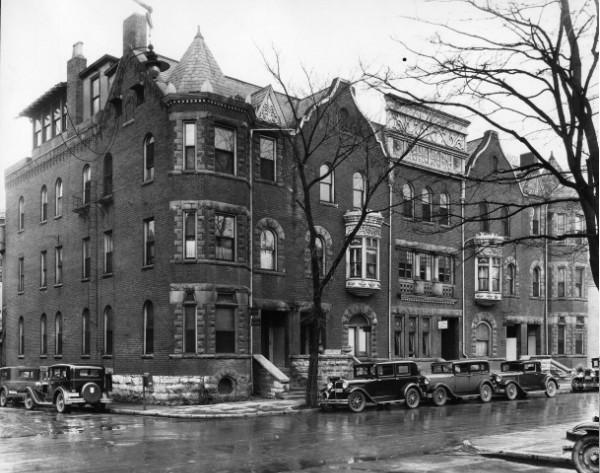 They were mostly built from deep, red brick, but they had heavy stone ornamentation with dark slated roofs. They featured peaks and spires, gabels and bays, balconies and arches. They were a lot to admire and, unlike so many other losses in Knoxville, they were adored at the time of their demolition. In fact, just prior to their downfall, the Ross Flats were the subject of a large article in the local paper entitled "Knoxville was the 'Lily of the Valley' - and Ross Flats Were New." The way the article reads, one would think that Knoxvillians considered this location to be a local treasure. Evidently, there was talk at that time of turning the place into an art museum in conjunction with the university. An artist's studio existed in one of the spaces when the article was written. It was called "Gallerie Omnibus", far out! Two more shops were occupied, one by a realtor by the name of Harold Hayes and the other by the Jones McBride Beauty Shoppe. One space was empty. By 1973, four of the eight row houses were already gone. The occupants of the shops and of the apartments above described the great features of the place, lauding the castellated stone effects, the oriel windows, the turrets and loggias, and the stone framed windows and arches. A visitor to town remarked to the author of the 1973 article, "Well, I'm happy to see that at least part of your city hasn't changed. I always enjoy the architecture along this way" when walking past the flats. If only someone had listened to that passerby. 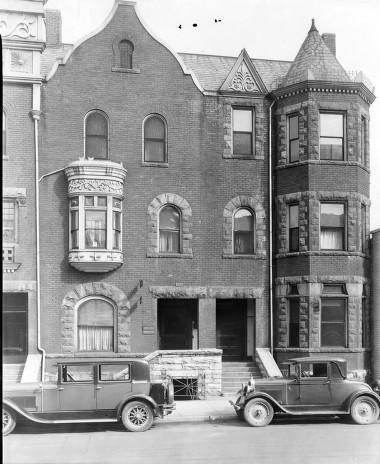 The flats were sold to an industrialist who had a materials business at Forks of the River, a Mr. Harold Burkhart. I don't know what his motivation (many of our lost treasures were destroyed in the name of progress or grand modern projects) but Mr. Burkhart removed the Flats from the face of Knoxville and replaced them with surface parking. Looking at the above picture, it is hard to imagine what used to stand on all of those yellow stripes and oil stains. But without further ado, the Ross Flats. The Ross Flat proudly filling a now empty corner of downtown. 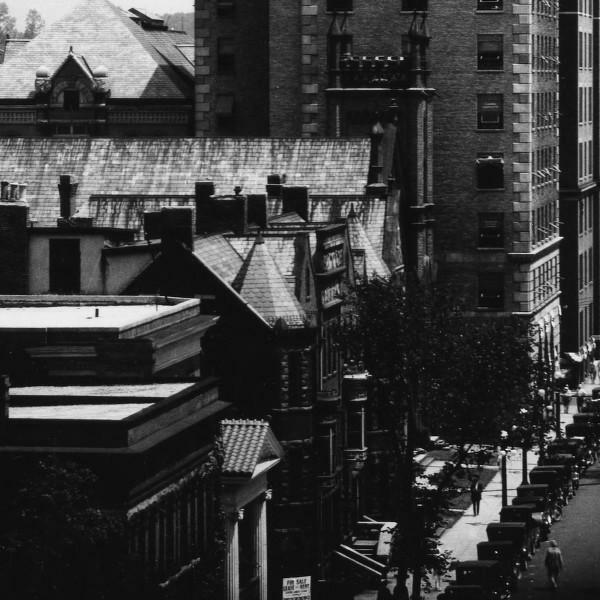 Looking east, one can clearly see how the character of Church Ave. has changed. 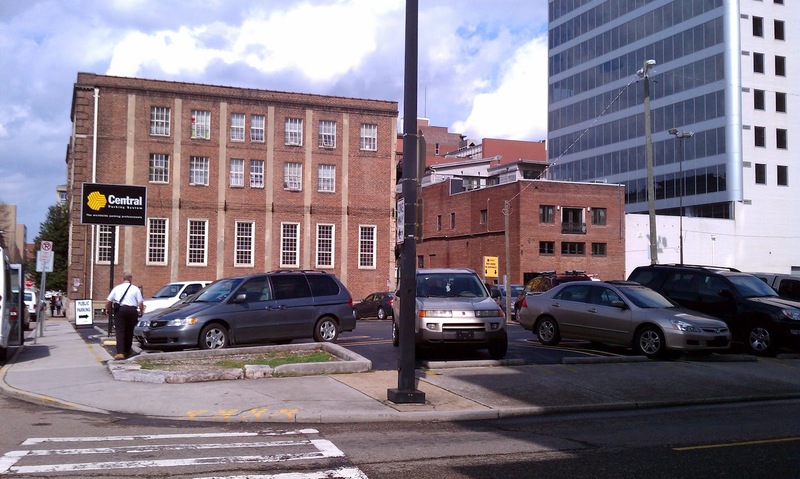 The Ross Flats are on the left, just past the white colums but before the Tennessee General building. A good shot of the extensive ornamentation found on the Ross Flats. 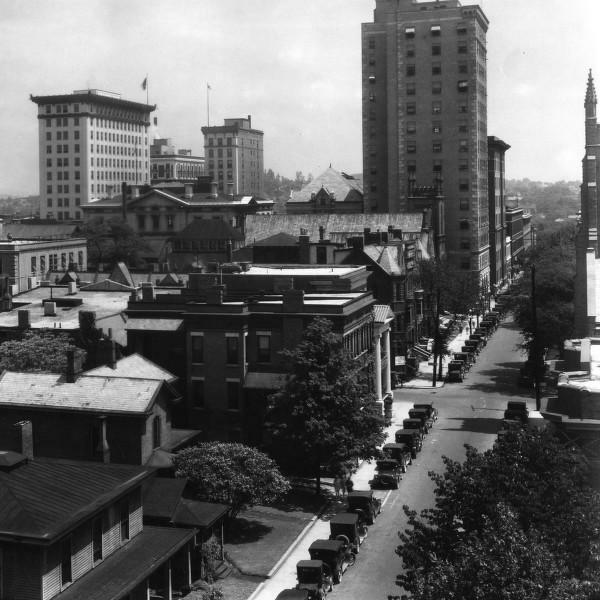 A closer shot, looking east down Church Ave.
From above, 1919, looking roughly west to east. St. John's is directly south (to the right) and the US Customs House is northeast (up and left). Ross Flats is circled. This photo depicts a very dense downtown compared to the modern photo below. A similar view looking north, today. Note, only a few buildings still exist from the original photo (the Customs House, Cherokee Lofts and its neighbors on Market St., and St. John's with the red roofs at the bottom. This may be the last photo taken of the Ross Flats. From the local newspaper, February, 1973. -Photos used with permission from the McClung Collection. Knox County Library System. John, This is another excellent entry and a heart-breaking one. I wish we could get the folks at St. Johns to read some of these posts. Honestly, I don't know how it wouldn't make them look at those buildings differently. The architectural wake-up for New York City came when Manhattanites awoke to find the glorious Penn Station lopped off and a tasteless high-rise built over it. Knoxville's wake-up has been more gradual and is still ongoing, but your post is a great alarm clock to prevent us from sleeping through more architectural travesties. Of course, buildings age and often outlive their usefulness in their original state. 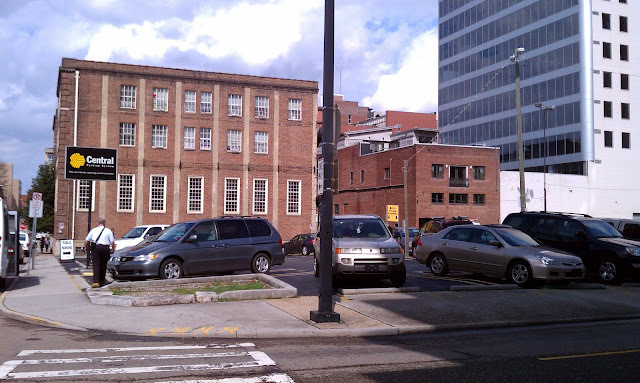 But to do as Knoxvillians have done--raze interesting structures simply to avoid maintaining them and turn the space into surface parking--is egregious and destructive to the fabric of the city. I certainly hope that the Sprankle debacle (and the lies that were told concerning that project) will be the last time we allow it to happen. A wonderful entry, as always! It makes me so sad to see such a beautiful masterpiece torn down. I wish so much that someone would come through and buy the surface lots and try to recreate some of the beautiful architecture that was lost. Can you imagine how much a loft in that building would go for today?